Friend, in this time of economic uncertainty, the cautious investor knows that he can trust in the long-term value of the New Order share. They were being sold at 1 million a pop back in June 2012, and they're being sold at the exact same price today. It doesn't get any more secure than that. I've always wondered what happens to this money. Is it funneled to CODE. and NODD's srp's or is there some other usage? You sir win this comment thread. Proceeds are used to fund the SRP to make high sec a better place. There is no better investment. I doubt a cautious investor would be happy if you tell him that his shares today have the same value that they have 18 months before. Fortunately, EVE stockholders are not that attentive. Just how much of 190 billion isk is left? Tens of thousands of illegal miner wrecks. Millions of tears from players who should have bought a mining permit. Billions of laughs from law abiding citizens. The investment has more than paid for itself. But even better, buying shares in the New Order is the investment that keeps on giving back to you. You just could have said 'not much'. Luckily for us, she didn't. its a very simple "Pyramid scheme"
Not 1 single isk will be transfered back to the investor. If 2 or 3 big investors are calling back their isk nothing will be happen. SO PLEASE DONT TALK ITS AN INVESTMENT. In fact its a donation for New Order. People are free to do as they wishes but its simply a LIE that New Order is an Investment. Please correct the term "investment"
Like any startup organization, investor money is used to fund operating expenses. Does Amazon even make a profit yet? 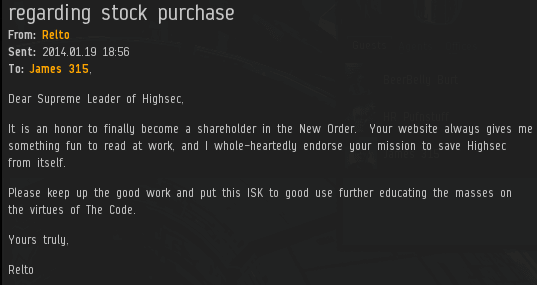 I don't know, but I know when all of hisec is paying 10mil isk per year in permit fees that the stock holders can be assured of a hefty return on their investment. It IS an investment, in a better highsec. It is not a pyramid scheme, you are simply revealing your ignorance here. "If 2 or 3 big investors are calling back their isk nothing will be happen." What do you mean, "calling back their isk?" Thgre is nothing in EVE online about "calling back their isk". There is nothing in the Minerbumping investment agreement enabling people to "calling back their isk". Next you'll be saying Minerbumping isn't a legitimate investment because there aren't enough pork bellies involved. That has nothing to do with anything. Next time do some research before spewing out nonsense. In economics, investment is the accumulation of newly produced physical entities, such as factories, machinery, houses, and goods inventories. In finance, investment is putting money into an asset with the expectation of capital appreciation, dividends, and/or interest earnings. " Investing in minerbumping satisfies all of the above, producing killmails and paying dividends of tears, day after beautiful day. You didn't know much...and you've learned nothing.